Telecommunication has become much easier recently and in the age of cell phones or low-rate distance calls, you might ask yourself: “Do I need a toll free number for my business?” There are several pros and cons to answer this question. Let me highlight some reasoning from the point of view of a small business owner. Beating the competition. 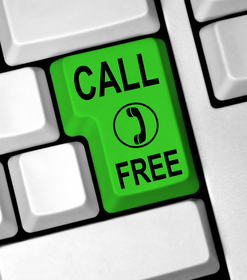 Both marketing literature and common sense say that if a customer can choose between a free-of-charge phone call and a call with any amount of telephone charge, they will call the 1-800 number first. Statistics also show that most customers purchase from the first company they call: this underlines the significance of such toll free numbers even more. I believe it is very important to reach out to the customer at that first point of contact. Upselling. One of the greatest advantages of having a potential customer at the end of the phone line is that you can perfectly understand what his needs are and thus give tailor-made advice. No guesses about target groups, no assumptions about probable needs, no mistakes. Just like as if we were in your store. And no question, this gives you a great chance to sell more, to increase the order size. Increasing conversion and loyalty. You can find no better advertising than the word of mouth, the references given by your satisfied customers. With a completely automatized online sales process, you can hardly get the real insights of your visitors. Consider. If only 20 percent more of your website visitors would turn into customers, you could multiply your profit. You’d better not leave those customers alone: when entering your site, show them a supportive hand, a free number to ask. It simply makes you understand your audience. Better service, more added value, more satisfied customers, more income. Receiving incoming calls. Who can handle all the incoming calls 24/7? This must be the greatest frustration for all who ever considered using a toll-free service. Do not forget, that most toll-free service providers give us the opportunity to forward calls arriving to the toll free number to any number we own. Even to our own mobile. Some provide voice message options. Moreover, using the online click-to-call solutions you can set opening hours, kindly offering visitors a call back option as an alternative. Yet when your international business reaches a high enough level, you might consider forwarding to a local call center to the given timezone to handle your customers with perfect care. Building trust and credibility. A toll free number also fosters the company’s credibility. How? With small businesses, the presence of a toll free number creates an air of seriousness, while these enterprises can also preserve their added value by the more personalized way of providing services. Clearly, the toll free number conveys the image of an established player with long-term plans. Of course, a toll free number cannot change everything in itself. A professional, ergonomic and aesthetically appealing website is also a very significant factor for the customers. By combining these features, we have come a long way for boosting the conversion rate of visitors to customers. This entry was posted in Business, Online Marketing, Other, Tips & Tricks, Webshops and tagged conversion, credibility, online visitors, toll free number, upselling by Péter Faragó. Bookmark the permalink.